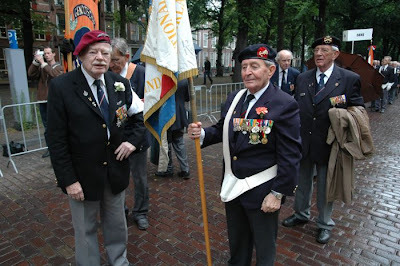 Repatriation from voluntary exile in Athens took place just in time for Dutch Vets Day 2008. This day of commemorations is only a very recent fixture, an exercise in transnational Political Correctness "in the service of peace". 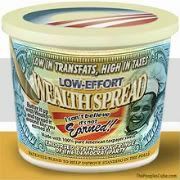 This message is emphasized so often that it lost all claim to honesty. The organizing committee is just too eager to avoid the impression of pride of country: it is the fallacy of the postmodern multiculturalist who believes that talking oneself down will uplift the downtrodden. Vets Day was invented by the government of the day to replace the commemorations at Hotel "The World" in the southern town of Wageningen, traditionally presided over by the late Prince Bernhard (God rest his soul). The World War II vets radiated comradeship and pride of achievement; they'd fought their way through the war, and shone with delight over the accomplishment of peace and prosperity. Opponents saw in it a perverse love of 'militarism.' Today's commentators can't stop to emphasize that "we are historically not a 'militaristic' country." Given the fact that it measures 300x300 kilometers, this is like declaring that chihuahuas aren't particularly eager participants in dog fights. 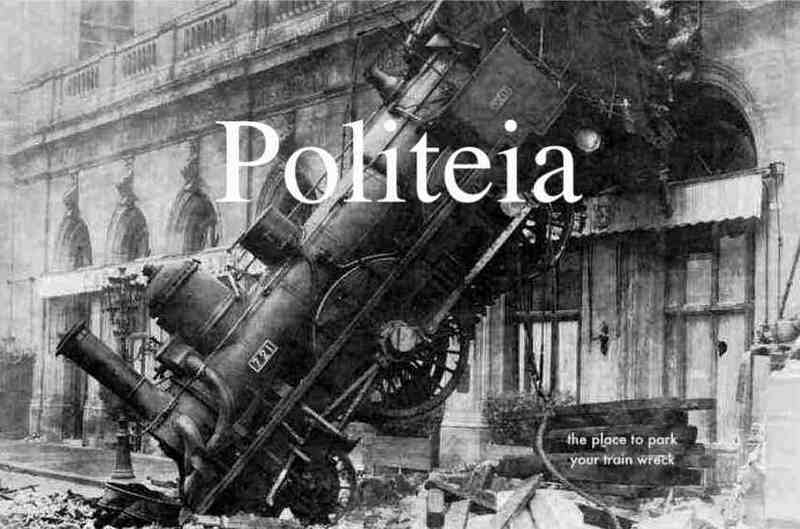 Today's docile service-men are inoculated from birth against such anti-ideological behavior, but the propaganda and indoctrination machinery proved powerless against the old dogs who wouldn't learn new tricks. When the Prince passed on a few years ago no time was lost in pulling the plug on the incorrigible goings-on at Wageningen. So instead we have Vets Day in the name of transnational appeasement at any price, rather than a reaffirment of the defence of liberty. The Greek national motto "liberty or death" is meaningless yada-yada to the Leftist dogmatists who chose red over dead. The concept of freedom has been taken to such perverted abstractions that no one knows for sure what its meaning is. Orwellian bromides like "real freedom through the state" are central teachings to the Hegel collectivist heirs. The original negative definition of "individual liberty not to be subjected to the whims and will of the collective" has long been obfuscated. Rousseau's "common will" is proliferating in the postmodern diminutive nation, the natives as yet blissfully unaware where their ideological engineering will ultimately lead. The following is a free translation from the historical site of Hotel "De Wereld," scene of the German capitulation in 1945. "In the first days of May in 1945 Canadian Lieutenant-General Charles Foulkes had chosen the town of Wageningen as the site where the German capitulation would take place. The German lines lay just outside the town. German military negotiators did not have to travel great distances through liberated areas and fear molest by civilians. 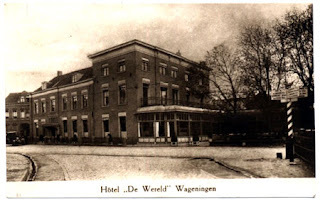 Another feature in favour of Wageningen was that the Germans had ordered its evacuation (...) When General Foulkes heard about a hotel called "The World" he decided this would be the place where German capitulation would be signed. On Saturday morning May 5 he ordered the Germans to appear at Wageningen at 11.00 hours. 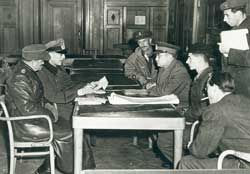 Chief of Staff of the 25th German Army, Lieutenant-General Reichelt appeared with his interpreter. Foulkes met them at the hotel. Also present was His Majesty Prince Bernhard as Commander of the National Armed Forces (seated in the picture on the far right, smoking a cigarette). Reichelt was ordered to return that afternoon, accompanied by the Commander of the 25th German Army, General-Oberst Johannes Blaskowitz. The final negotiations took place at 16.00 hours. Blaskowitz, Reichelt and their interpreter entered the Great Hall of "De Wereld." The men saluted. (...) Asked by General Foulkes if Blaskowitz was prepared to capitulate the German Commander answered: ‘Jawohl'. The capitulation orders were signed and Hotel "De Wereld" became a monument (...) >>> (text in Dutch, regret no English version seems available).